At the edge of the Silesian province, in the south of Poland, on the Visla River lies the town of Czestochowa. On the limestone hill is situated the church with the monastery of Jasna Góra. The hill rises to a height of 340 m.
The main purpose of visiting the sanctuary [A 15th-century Gothic chapel] is the image of Our Lady of Czestochowa called “The Black Madonna”. The holy picture was painted, according to the tradition, by St. Luke the Evangelist, who painted two pictures of the Virgin Mary on a tabletop once used by the Holy Family. The monastery’s treasure-house, the arsenal and the museum of the sanctuary’s 600th anniversary are worthwhile to be visited. 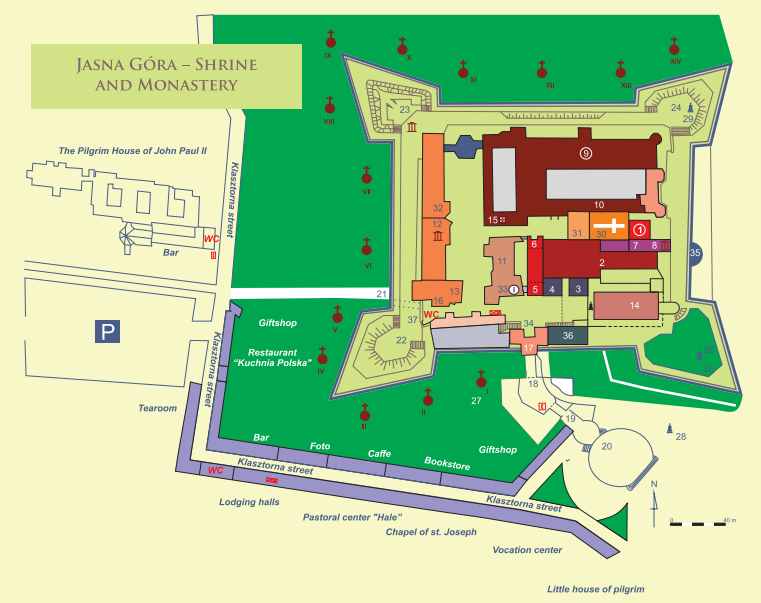 In the web page of the Archdioceses of Radom we can find that there is the green route (see graph 1) that is for the Radom cycling pilgrimage to Jasna Gora and five options for Pilgrims on foot that are called columns [because people that participate in the pilgrims’ march walk in columns]. In the image below we can find the different columns: Column I and II from Radom , column III from Skarzysko, column IV starts its pilgrimage from Starachowice, and the column V from Opoczno. They meet in Mstow about 10 km from Czestochowa. In 2016, the National Pilgrimage group came from the following destinations: Rzepin, Radom, Radom Akcja Katolicka, Poznań, Chrzanów, Kruszwica, Jasło, Nysa, Świdnica, Myślenice, Międzyrzec Podlaski, Tychy, Łaskarzew, Żelechów, Chełm, Włodawa, Sulbin, Poręby, Sokół Radlin, Szydłowiec, Bytom, Chorzów, Cyprzanów, Rybnik, Zwoleń, Sokołów Małopolski, Konstancin Jeziorna, Opole, Piaseczno, Przyrów, Głuchołazy, House anice, Radom sko, Myszków, Katowice, Mikołów, Tarnowskie Góry, Gliwice, Sosnowiec oraz grupa z diec. szczecińsko-kamieńskiej. The coordinator of the pilgrimage on behalf of the Polish Episcopal Conference and the Main Board of PTTK was Jerzy Grochowski, a priest from the House anice Diocese who, in company of a group of 58 people, arrived to Czestochowa. 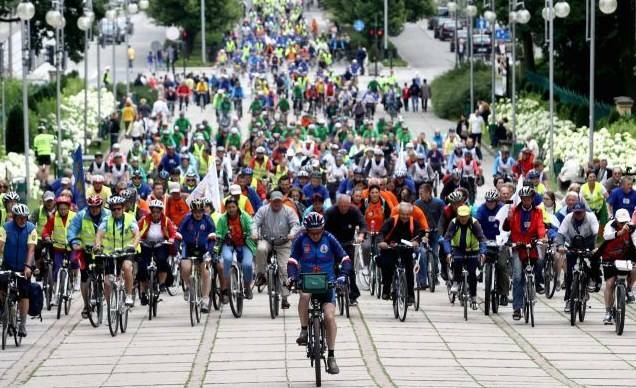 The oldest pilgrim from the ”Poznan Pilgrimage Cycling” was Zenon Gil, a 74-year-old, who organizes the cycling pilgrimage over the last five years(Ibidem). After presentation of route, we can conclude that there are a lot of accommodation and services available for pilgrims and tourist that would like to include some other activities in their way from Radom to Czestochowa. Not only cultural and natural resouces come on the way, but visitors can also have some rest in many good quality hotels, hostels and agroturistic places. Pilgrimage route are organized professionally and by different people or organizations like: bishops, clergymen, Non Governamental Organizations, secular groups… Therefore, the organizers of pilgrimage are able to adapt to the requirements of the pilgrims, providing services at a higher quality and with additional attractions. With the increase of the number of pilgrims to Jasna Gora and other religious centers in Poland and the quality of services, people involved in tourism management and tourism services offer a better access, safe roads, and comfortable accommodation for customers. This is a big success in recent years achieved by many Polish towns.